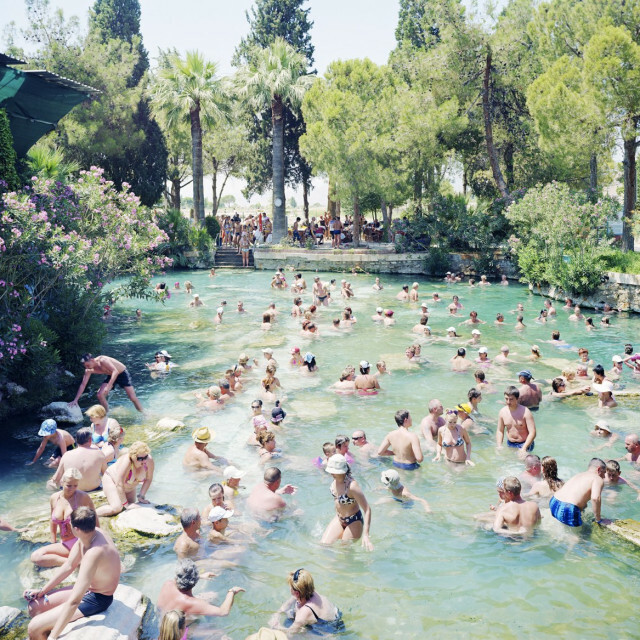 M+B is pleased to announce an exhibition of new work by internationally acclaimed artist Massimo Vitali. Vitali's unique views of the rites and rituals of modern-day leisure have garnered praise since he began photographing in his signature style in 1994. Featuring new work from 2009 and 2010, this exhibition includes eight large-scale color photographs from Austria, Croatia, Sicily and Turkey. The exhibition opens September 11, 2010 and runs through October 16, 2010 with an opening reception on Saturday, September 11from 6 to 8 pm. Concurrent with the exhibition is the release of Vitali's third monograph published by Steidl titled Landscapes with Figures 2. Vitali's photography occupies a place between documentary realism and the surreal. His landscapes are casually inhabited by figures such as sunbathers and tourists who often forget about the photographer's presence, as he waits for such a moment while perched 20 feet in the air on a platform. Ever interested in the ways in which people interact with their environment and each other, Vitali's images satisfy a sociological desire as well as a voyeuristic longing to observe unawares. On this level his works are happily profitable, as each mural sized work allows for the intimate perusal of hundreds of candid portraits. Massimo Vitali was born in Como, Italy in 1944. Internationally respected for his acclaimed oeuvre of large-scale works depicting people at play and masses at leisure, he has photographed beach scenes, ski locations as well as tourist destinations. Vitali has exhibited extensively in museums and galleries worldwide and his work is found in some of the most important private and public collections in the world. This will be his third exhibition with M+B.